When Is It Time For Metal Roof Replacement? Home/Blog, Roofing, Uncategorized/When Is It Time For Metal Roof Replacement? Metal roofing is quickly gaining in popularity as more homeowners become aware of its excellent longevity and typically easy maintenance. New homes are often constructed with metal roofing, rather than other types of roofing materials. 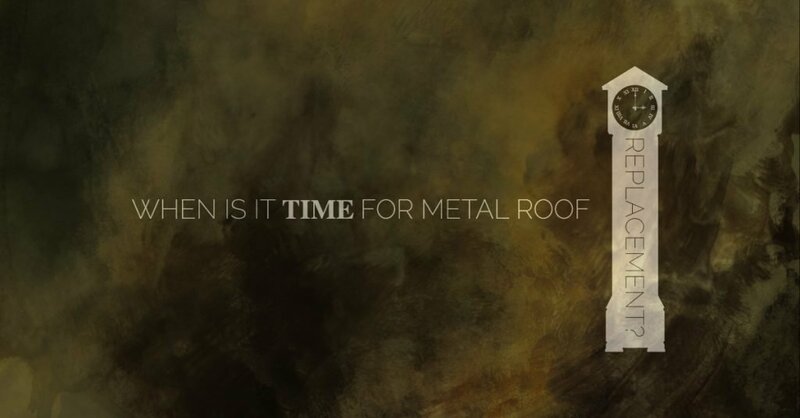 This inevitably leads to questions about metal roof replacement, such as how to know when it’s time to replace it, when to replace rather than repair, and signs that a metal roof may be failing. Metal roofs typically have far fewer issues than traditional shingled roofs, but there can be signs of failure, even early in the life of the roof. These include spots of rust, leaks and damaged areas. Whenever you suspect there’s a problem with your metal roof, it’s important to have it inspected as soon as possible. A professional roofer will be able to tell you what the problem is and give recommendations on how to fix it. Metal roofing is a very long-lived option for roofing your home. Any problems can usually be addressed through repairing the problem areas, but sometimes the problem area is too extensive. Rust that has been left untreated, damage from severe storms, and excessive leaks may be problems that simply can’t be repaired, leading to a complete metal roof replacement. Metal roofs last longer than traditional shingled roofs. If they’re properly installed, metal roofs can last as long as 40 years or more. Metal roofs can fail due to problems with the installation hardware, and leaks are a sign that something needs attention. Other than that, you probably won’t have to worry about replacing a metal roof unless there’s damage from severe weather or other sources. At A-1 Property Services, we understand that you could be facing a difficult decision when it comes to metal roof replacement. We’ve been serving the greater Miami area for over a decade, and we take great pride in making sure our customers are satisfied. If you’re dealing with a leaky metal roof, or you see obvious signs of its deterioration, it’s time to call our experienced professionals to better understand the problem and how to fix it. We know how important it is to protect the investment you’ve made in your home. Contact us today for a free estimate and more information on repairing or replacing your metal roof.